How did Croatia beat Argentina 3:0? Croatia surprised the world when they were able to defeat Lionel Messi’s Argentina 3:0 in the group stage. The clear strategy of Dalic and his men was to use the height and strength of their players to dominate the game in aerial duels. The possession game was very direct and short-lived while the game revolved mostly around Croatia’s midfield pressing block and Argentina’s positional play in possession. If Dalic’s men could win the direct ball they would attack, otherwise, they focused on creating counter-attack opportunities through their pressing and winning high balls from the Argentinean build-up play. 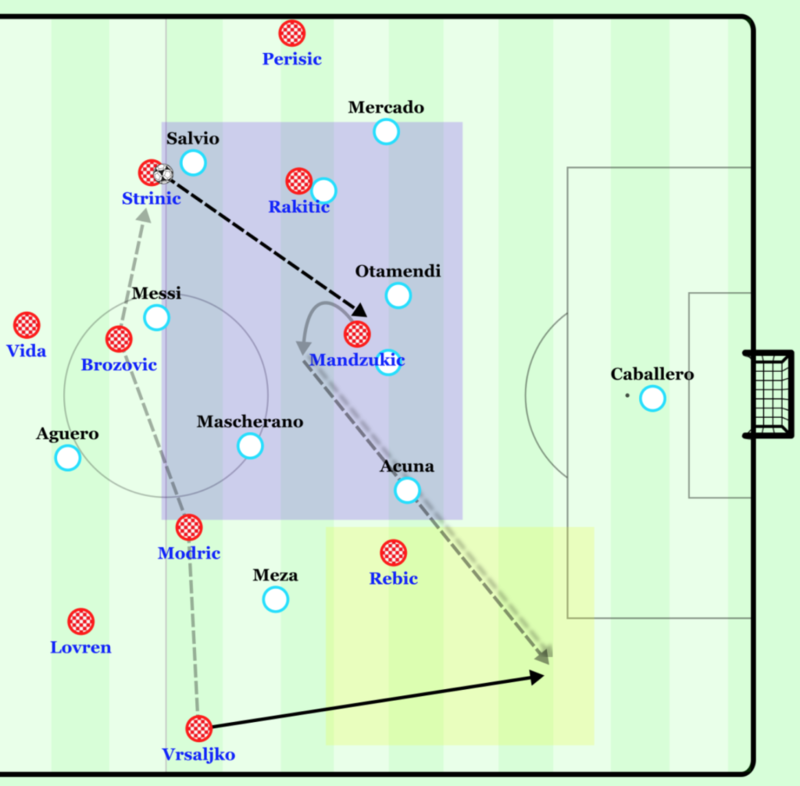 Systems for the match – For Argentina, it is more about their movements in possession, for Croatia, it is more about their movements when pressing. If the game were to be simplified into one pivotal phase, it would be the pressing in midfield for Croatia – which is simultaneously the possession in midfield for Argentina. Croatia deployed themselves in a 4-3-3 structure, the only time I have seen them do this in the past is their match against Mexico in the build-up to the tournament. They use the 4-3-3 strictly when they are looking to press an opponent who uses three central defenders; otherwise, they would use their usual 4-4-2. So the motive fit when they came up against Argentina’s 5-3-2/5-2-3 formation. There were a few fundamental differences in the pressing scheme when compared to the one used against Mexico though. Against Mexico, their 4-3-3 had the three clear strikers maintaining the highest line and being as narrow as the halfspaces, while the three central midfielders were as narrow as the halfspaces just 1 line behind. In this match against Argentina, the wide strikers were focused on marking Argentina’s wing-backs – this meant that the wide strikers would drop very far back and toward the wing. The two #8s for Croatia would then be in close support of Mandzukic, creating a formation which resembled a 4-(wide)3-2-1. Another difference would be the behavior when putting pressure on the three central defenders. Against Mexico, the front three strikers would press out to the central defenders once they received the ball. Against Argentina, the wide central defenders were left more or less wide open as Modric and Rakitic focused on marking Perez and Mascherano. Mandzukic would position himself directly in line with Otamendi and press vertically toward him when he was on the ball. This allowed Croatia to have a heavy defensive overload in deeper zones. Leaving the wide central defenders open allowed them to mark the opponent wingbacks with their wingers and then mark the halfspace attackers (Messi and Meza) with the fullbacks. Theoretically, this leaves Brozovic (who had an excellent performance) as the defensive midfielder and the two central defenders in a three vs. one advantage against the center forward for Argentina. From this base-area of control, the central defenders and Brozovic could shift toward the ball-near side of the field and create defensive overloads when defending the wings. As the game progressed the behavior of the Argentinean players began to change and so the pressing scheme ran into some problems. The defensive overload provided by leaving the wide central defenders open. In this case, Perisic marked Salvio because the movement of Perez meant Rakitic would press into this zone. Vida, Brozovic, and Strinic form a compact triangle around Messi. When the Argentinean wide central defender would receive the ball in circulation Modric or Rakitic (depending on which side the ball is) would at times run out to the central defender while attempting to keep the defensive midfielder they normally marked in their cover shadow. Ideally, Brozovic would be above to shift forward and take over this mark from the #8, but as the game evolved and more players began dropping into central midfield, he was less capable of supporting the higher pressing runs of his fellow central midfielders due to being occupied in the deeper zones. The idea was to shift passively in this 4-3-2-1esque shape and win any passes into the higher zones to potentially launch a counter-attack. Messi began playing more as a second-striker, which had interesting effects on the left side of Croatia’s press. Due to Messi moving into the zone of the central defender, now Strinic could be the one to focus on the right wing-back of Argentina – this allowed Perisic to maintain a higher and narrower position, which lead to him at times pressing Mercado in front of him. This meant that Rakitic could keep his central midfield position on Perez and not have to worry about pressing out to Mercado as often. Because the distance between Strinic and Salvio was quite large, the Argentinean central defenders often looked to play long diagonals behind the Croatian midfield block into Salvio to attack Strinic. Long balls behind the defense were the main route of attack for Argentina throughout the game, despite having wider central defenders who frequently had space and time to dribble forward and attack. Otamendi, in particular, was the most offensive-minded of the three central defenders, and he looked to play long balls behind the defense or dribble into midfield more than the other players in the build-up. If he played in a wide central defender role, he might have had a larger and more positive impact on the match for his team. As mentioned above, they were incapable of exploiting the time and space their wide central defenders had. Due to the heavy overload and man-marking in defensive areas for Croatia, Argentina had a very difficult time creating a free man in higher spaces past the Croatian central midfielders – and so the build-up players looked to play passes into space behind the block. Naturally, Messi began to drop into central midfield as well. This attracted the attention of Brozovic, which resulted in his inability to cover the positions of Rakitic and Modric when they decided to press higher and toward the wide central defender. Due to the wide central defenders being free, the most simple and readily-available way to attack the Croatian defense was for them to dribble forward and then play a (typically chipped) through pass to the high wing-backs running behind the poor man-marking of the Croatian wide strikers. 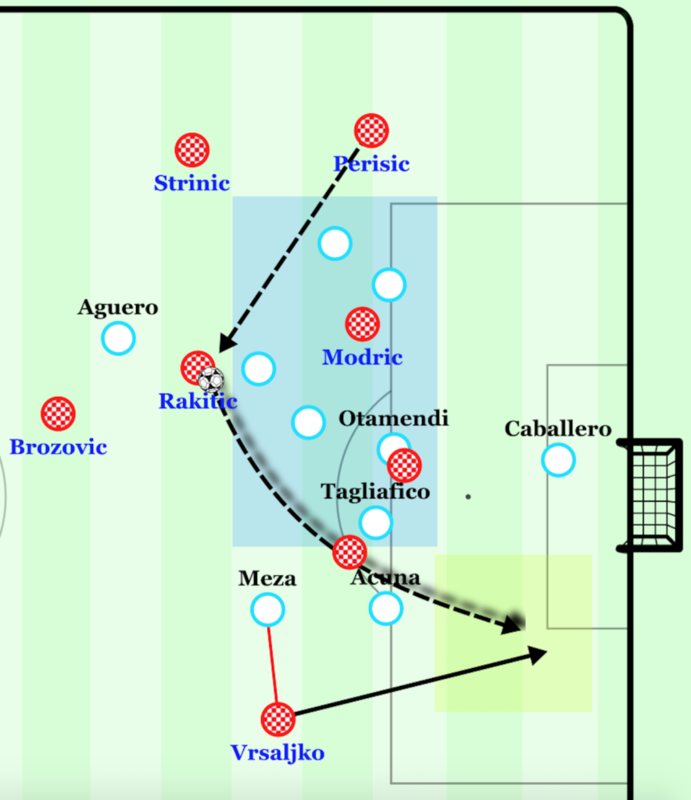 While Argentina rarely used this route of attack in the early stages of the game, their best chance in the early stages came from this approach as Rebic failed to clear the chipped pass properly and it fell to an Argentinean player in front of an open goal – though he failed to finish. As the game proceeded, Mascherano became more and more involved in the first line of build-up play. First, as Modric began running toward Tagliafico, Mascherano would move closer to the defensive line and try to escape the cover shadow of Modric. Because Brozovic was not available to move higher and cover Mascherano as Modric left the position, it was Mandzukic who would drop deeper and closer to Mascherano in the 6-space. Now, Otamendi would drift farther off toward the right halfspace (farther from the potential access of Mandzukic) and once he receives the switch, he could run forward with the ball to being playmaking. During his run forward, Messi drifted onto the wing while Salvio occupied the space in front of the fullback. In theory, this meant Perisic was now responsible for Messi on the wide position (remember, he wasn’t used to Argentina having an attacker in both the right wing and the halfspace because Messi moved into more of a second-striker position). As Otamendi dribbled forward and attracted Perisic’s attention, now Messi was completely free of a marker. The ball was played wide and Strinic left Salvio to press the wing – leading to Messi playing Salvio’s run through the halfspace down the wing for cross. The cross was attacked by the center forward, the far #10, and the far wing-back – which resulted in a very good chance. Argentina could have potentially discovered a new route of attack at this moment, but this same type of attack rarely ever occurred in the game again. An example of the halfbacks having space and time, but Otamendi tries a vertical pass into Higuain. The four central players in the structure collapse on the ball. Modric intercepts the pass and launches a counterattack. The Argentinean’s had to create such a big advantage positionally that Otamendi could dribble down the right side of the field while Mercado kept his position and offered almost nothing to the attack. 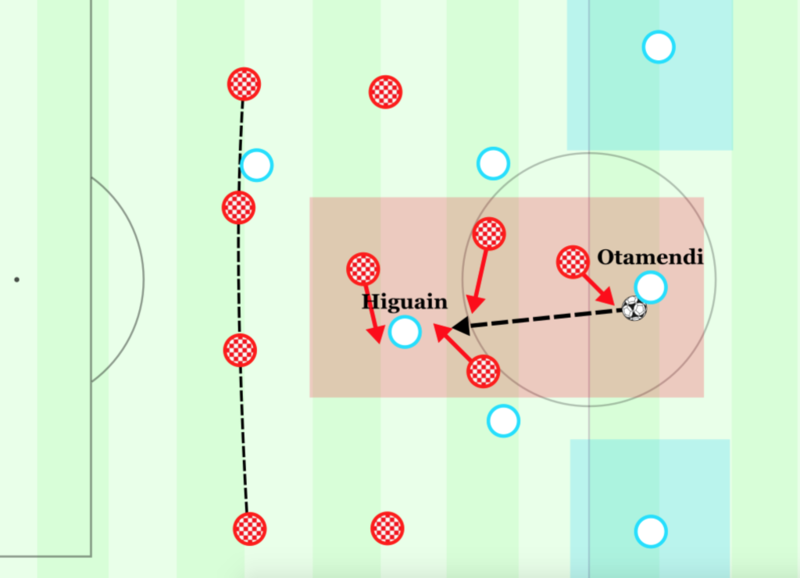 Instead of exposing the fact that their wide central defenders could perform this role of dribbling forward more frequently, they needed to play so well that the central central-defender in Otamendi could move into this position and drive forward…that’s quite a high demand on the positional play. A key aspect of offensive play is for the build-up players to dribble forward if they are free so that they can create an advantage in the attack should a defender move toward them and free a teammate in a higher position or should no defender move toward them and they can play the ball behind the defense. Argentina’s central defenders and defensive midfielders almost never did this, which resulted in Croatia simply continuing to shift passively toward the ball while not worrying about being exploited by the build-up of Argentina. This is certainly a good example of why Messi is more effective when he plays for Barcelona, as their players are far more skilled in build-up play and freeing their teammates in higher positions on the field. Mascherano began to become even more involved and dropped completely into the defensive line during the build-up, forming a line of 4 in the first line. At this time Messi dropped further into central midfield to prevent Perez from becoming isolated in the center. This is where bigger problems began to arise for the Croatian forwards who attempted to press the build-up. Normally, every team has an alternate pressing scheme for when the opponent defensive midfielder drops in between central defenders – in this case; it seemed that Croatia wasn’t prepared for this and tried to keep the same scheme for a different structure. The wide central defenders now fanned out even wider, and the Croatian #8s still tried to press out towards them when the ball was played there. With the wide central defenders being closer to the wing and having both Otamendi and Mascherano covering them, they became much more offensive. Tagliafico and Mercado have often played fullback for their club teams and so it was likely more natural for them. The distance Modric, in particular, had to cover was very large while having no support in his pressing against multiple opponents. For this reason, the best Argentinean attacks from organized build-up play were born out of the left side of their attack. The green box highlights the entire four vs. two situation. Modric now has to move between Perez and Tagliafico. Mandzukic moves between Otamendi and Mascherano. Brozovic is focused on Messi. From this structure, Argentina was able to cause some problems to Croatia’s press. As mentioned earlier, Perisic on the left side of the field focused more on pressing Mercado while Strinic focused on Salvio anyway, so their adaptation to this new build-up structure was less difficult. Rakitic simply remained in the central midfield zones more often but attempted to press Otamendi in support of Mandzukic when possible. On the opposite side though, Rebic was focused on marking Acuna while Vrsaljko focused on Meza in the halfspace. Modric had to press Tagliafico, Perez, and at times even Mascherano (who was in the left central defender position more often) depending on how Mandzukic moved. Remember, Brozovic cannot support him due to covering Messi! Mandzukic tried to move between pressing Mascherano and Otamendi, though this was more difficult than it sounds due to the skill of these two central defenders in build-up play. Both have been thoroughly coached by Guardiola in building out of the back, so a two vs. one advantage for them was enough to begin exploiting the Croatian center forward and free themselves. Due to Modric’s trouble accessing Tagliafico in wider areas while leaving Perez open, Mandzukic would attempt to help by dropping into midfield closer to Perez, but this left the central defenders more open. The key detail in this case though is that Croatia still focused heavily on covering players in their more defensive zones, despite leaving Mascherano and Otamendi more open. Even though the two Argentineans had time on the ball, they couldn’t find passes into midfield to free players as frequently because the Croatian forwards worked hard to cover the players. In the end, Argentina continued to play longer passes behind the defense rather – even though they began to build attacks down the left with shorter passing more frequently. Of course, Croatia was very capable at defending these longer and higher passes in the air, and so they weren’t too troubled by the attempts into depth. As mentioned above, Croatia didn’t always defend the combinations down the left well. An example is when the ball was played out to Tagliafico and Modric ran out to him while Mandzukic stayed with the central defenders (which means Brozovic would have an enormous amount of space to cover to come across and block Perez while leaving Messi to Rakitic on the ball-far side). This left Perez open in the center, and he dribbled past Brozovic into the space between the lines – though he didn’t create a useful chance, Argentina began creating situations where their passers are in front of the opponent defensive line more often. More variations began to arise in the second half. Meza would drop more often into the midfield, so Perisic (who was switched to the right side when Kramaric came on for Rebic to the left wing) focused more on covering the halfspace where Meza is while Vrsaljko could focus more on marking Acuna on the wing. As far as adaptability goes on wing defending, Croatia did well when compared to how they handled the central defenders. Higuain and Dybala are subbed onto the field and Argentina improves slightly. Higuain had an immediate and positive effect on the game in comparison to Aguero due to his ability to receive the ball in the center, drop into deeper spaces, and play effectively to his teammates running forward on the sides of him. Aguero is more capable in a role where he focuses on staying high and running behind the defense or using his direct dribbling. Higuain is better when it comes to receiving the ball with his back to goal, playmaking to others, and dropping deeper. With both Higuain and Messi dropping deeper into central midfield, Brozovic has to help mark the two strikers while Perez becomes even freer due to no support whatsoever being available to Modric when covering two players. A counter-attack which was played into Higuain’s feet by Messi and then wide for a cross and then an attack which Perez is able to receive the ball freely in the center and consequently play Higuain’s run behind the defense for a dangerous cross are two immediate examples of Higuain’s impact on the game within a few minutes. Higuain dropping into the center allowed Perez to more clearly take advantage of Modric moving between two players. Brozovic must move to Higuain and therefore cannot help the wing pressing. As Perez receives the ball, Higuain runs into depth and puts in a dangerous cross. Dybala moved into the right wing role when replacing Salvio, and offered a simple long diagonal option for more direct dribbling and combining with Messi to playmake from the left. Due to the build-up players from Argentina still not being able to consistently build through the left (because Higuain would sometimes remain higher, and Mandzukic would support Modric by covering Perez to varying degrees throughout the game), the long balls were still the most frequent route of attack in the end. With Dybala and Messi’s creativity down the left after a long switch, there were a few dangerous attacks created down that side. Overall, Croatia was still able to defend successfully due to the lack of consistency in the Argentinean positional play and the willingness of players such as Modric and Mandzukic to run further distances into defensive positions. As mentioned in the introduction to this analysis, the main strategy for Croatia was to take advantage of their ability on higher, more direct passes. When we look specifically at the three goals, Dalic’s men scored, each had an element of winning aerial duels. The 1st goal came from a long and direct pass to the striker by Croatia’s defenders. The ball was flicked on toward the GK as the aerial duel occurred, and after pressing through to the GK, a mistake occurred for an easy 1:0. The 2nd goal happened when the ball came back to the GK and he cleared the ball into midfield. The Croatians won the ball and played it to Kramaric on the left wing. Kramaric sent Rakitic on a run down the wing, and Rakitic cut inside his defender to again play Kramaric running down the wing. Once Kramaric arrived at the box, he cut it back to Rakitic in the halfspace for a long shot. The ball is cleared again and the Argentinean counter-attack is stopped in midfield. Brozovic immediately sends Kramaric down the left wing once again, he cuts it back to the halfspace again…and this time the ball is played across to the center for Modric to hit a long shot for the 2:0. The 3rd goal came from a simple long clearance from the Argentinean GK in the dying moments of the match. The Argentineans had one central defender in a defensive position while Rakitic, Kovacic, and Kramaric all remained in a high position. The ball is won by Croatia, and Modric plays Kramaric through to attack three vs. one with his teammates…and the rest is history – 3:0. Rakitic looking for the free blind-side run of Vrsaljko after a short pass back into the halfspace from the winger. This was a method which creates multiple dangerous chances. 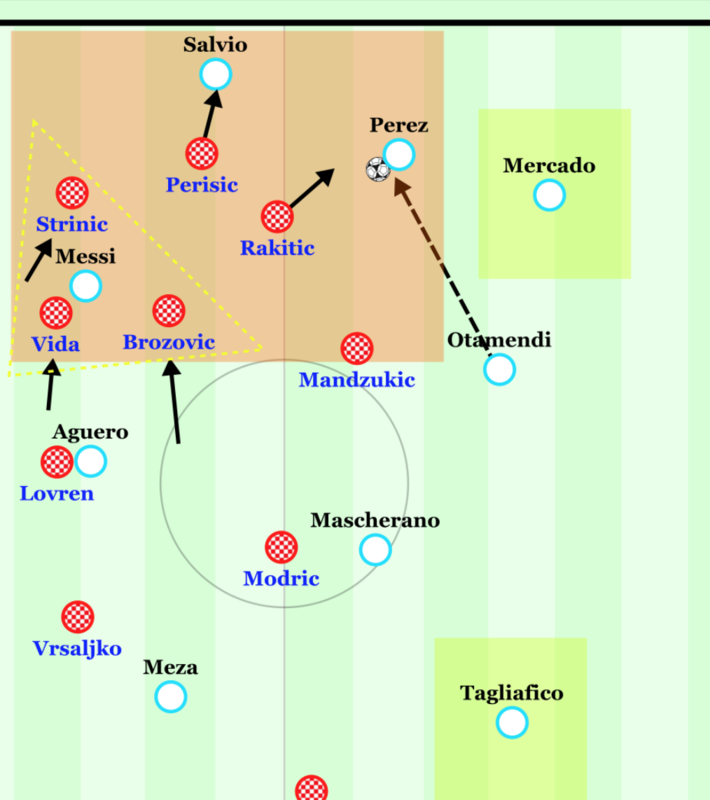 Throughout the game, Croatia focused on luring out the Argentinean high press with shorter passes in the back before playing long balls to the three strikers. The circulation speed was slow, so Croatia struggled to combine down the wings after a switch due to Argentina arriving to the wing with good timing to press and win the ball. 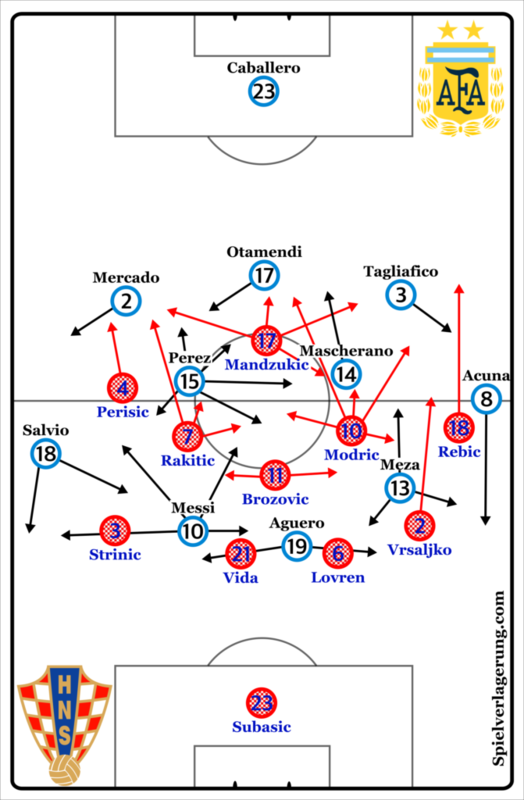 The general approach for Argentina on the left was to have Aguero press the central defender, Meza press out to Vrsaljko, Acuna press Rebic, and Mascherano press Modric. At the same time, Messi would move then toward Brozovic in the 6-space while the two ball-near central defenders covered Mandzukic, and the ball-far defensive midfielder covered the center. On the right side, it was a slightly different scheme. Messi would press the central defender while Salvio (the right wing-back) would run forward a long distance to press Strinic (instead of Perez doing it, for example). Perez stays on Rakitic and Mercado moves out wide as a right back toward Perisic. 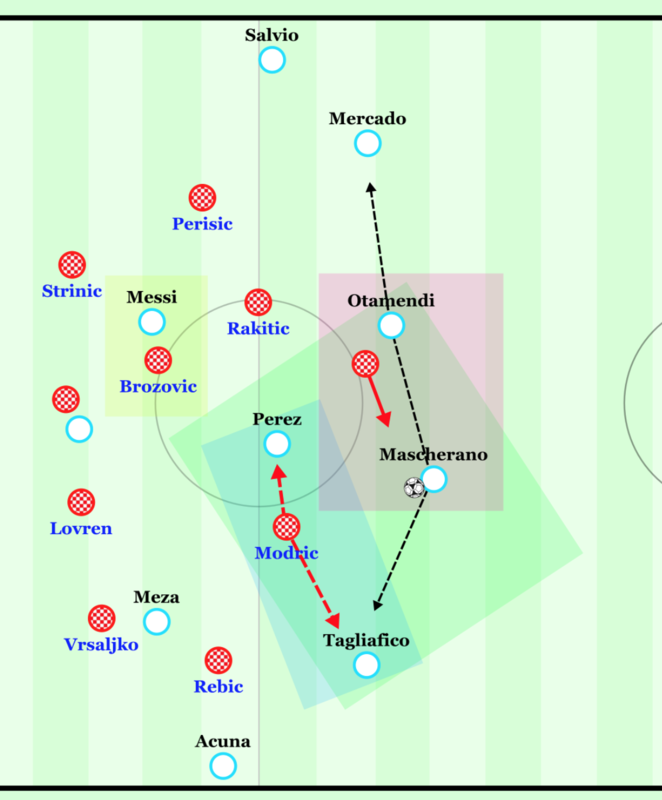 Croatia exploited this rotation a few times and Argentina wasn’t able to do it with enough speed to tightly mark each player – so long passes down the wing to an open Perisic resulted in a few attacks. Salvio’s movement was especially exploited when he would move forward to press Strinic on a back-pass toward the Croatian GK. The ball would be immediately cleared toward Mandzukic and Perisic into the space behind Salvio, and with Mandzukic flicking it on past Mercado, Perisic was able to break through the wing. The goal-kicks for Croatia were quite simple as well. The two central defenders would spread to the sides of the box while Brozovic occupied the space in front of the GK. Messi and Aguero positioned themselves evenly between these three players, but their press didn’t have time to take effect as the ball would be played short to a central defender to immediately hit a long ball down the side to either Rebic or Perisic. Croatia did not have to win the long balls to cause damage. For example, Rebic would simply challenge for the header – and the ball would move over Mascherano’s head back toward the Croatian goal and into Modric. Modric picks up the second ball and dribbles forward to create an immediate counter-attack. Croatia skipped all build-up passes through the middle to potentially create fast-break opportunities from second balls off an aerial duel. 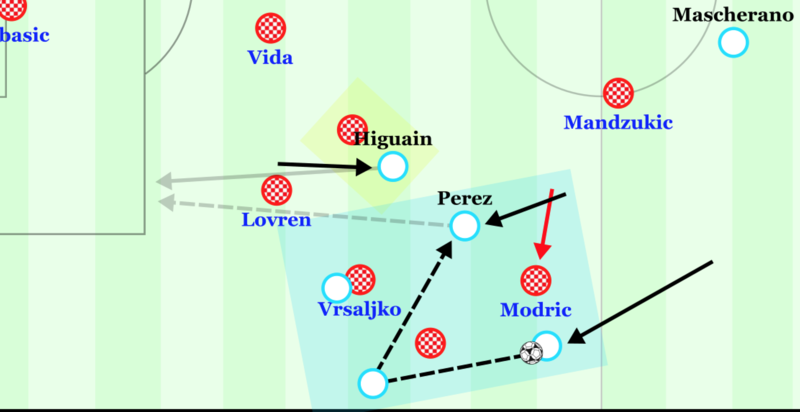 When Dalic’s men counter-attacked through the wings, their most effective pattern of attack was to cut the ball back to the ball-near halfspace (Perisic into Rakitic on the left, for example) for the central midfielder to hit a diagonal toward Vrsaljko on the ball-far side running past Meza to be completely free in the box. This resulted in roughly two clear goal chances alone. After a switch of field from a high throw-in, Strinic contacts the center forward. This focuses the defense on the center, and as the center forward turns he can exploit the opponent’s field of view and compactness with a diagonal ball to Vrsaljko on the far side for a breakthrough on the wing. Another dangerous method of attack. If the second ball didn’t occur and the ball went out of bounds in a high position for Croatia, they would begin their possession in midfield from throw-ins in the opponent half. This is a safe and consistent way to attack when you have an advantage in aerial duels as Croatia does over a lot of teams. In this match, most throw-ins occurred on the side of Vrsaljko, and it was common to see the ball thrown into the central midfield for a switch into Strinic on the ball-far side. From this position, Strinic often looked to play direct low passes into the feet of Mandzukic. Even though Kramaric is more capable in these situations with the back to goal in front of the opponent defense, Mandzukic did well on a few occasions to control this ball from Strinic (at times helped on by Rakitic’s dummies) and turn to switch the ball directly to Vrsaljko running forward. On one occasion Vrsaljko was able to dribble diagonally at the edge of the box and play an in-swinging cross to the back-post run of Mandzukic for a very dangerous header that could’ve easily resulted in a goal. Overall, the strategy was effective and intelligent in this case by Dalic – an impressive showing by the Croatian manager on the world stage. In the end, it was a deserved win for Croatia if we look at the quality of chances. Argentina began to find new paths to build-up with shorter passes toward the opponent box as the game went on – even though the result is harsh, they showed signs of figuring out how they should play. There is still hope for Messi’s team in this tournament (depending on their result against Nigeria and Iceland’s result against Croatia), but it will require them to figure out a more efficient positional play and which highly-effective bench players they should put into the starting line up for future matches. Dalic came into the match with an effective game plan. With a 3:0 result against Argentina, many are considering Croatia as a team on the same level as Brazil or Spain. Their best bet to make it far in the tournament is to focus on their pressing game, counter-attacking, and more direct play in possession. Their typical possession game and counter-pressing has a lot of issues, and if they can continue to use this 4-3-3 structure and focus on counter-attacks, they can create more attacks overall than they usually would in their 4-4-2. While their pressing isn’t perfect, its more effective than their possession game (though if they use the 4-3-3 in possession as well, there is potential to be effective). Great Analysis of the game. Great analysis. One of your best, I think. I thought Brozović displayed great anticipation of any passes or moves coming into dangerous areas in front of the defensive line. Read and cut out a lot of ARG action.